Many industrial processes produce effluent which is either too acidic or too alkaline to be safely discharged to drain, a piece of process control plant which is intercepts this and corrects the pH to make it safe to discharge to drain is called a pH neutralisation system. Since our foundation in 1982 we've supplied equipment and systems specifically for the pH neutralisation of waste water from industrial processes. With colour touchscreen for logging all process variables. P7687 pH controller with P&ID control. P7687 pH controller with P&ID control. PS90s dip pH electrode assembly. Duty air operated double diaphragm pump. Assist air operated double diaphragm pumps. Control Panel. With colour touchscreen for logging all process variables. P7687 pH controller with P&ID control. P7687 pH controller with P&ID control. PS90s dip pH electrode assembly. Duty air operated double diaphragm pumps. Assist air operated double diaphragm pumps. Control Panel. P7687 pH controller with P&ID control. P7687 pH controller with P&ID control. With colour touchscreen for logging all process variables. PS90s dip pH electrode assembly. Duty air operated double diaphragm pumps. Assist air operated double diaphragm pumps. Control Panel. P7687 pH controller with P&ID control. P7687 pH controller with P&ID control. With colour touchscreen for logging all process variables. High Speed Industrial Mixer. PS90s dip pH electrode assembly. Duty air operated double diaphragm pumps. Control Panel. P7687 pH controller with P&ID control. P7687 pH controller with P&ID control. With colour touchscreen for logging all process variables. High Speed Industrial Mixer. PS90s dip pH electrode assembly. Duty air operated double diaphragm pumps. High Speed Industrial Mixer. PS90s dip pH electrode assembly. High Speed Industrial Mixer. PS90s dip pH electrode assembly. High Speed Industrial Mixer. PS90s dip pH electrode assembly. High Speed Industrial Mixer. PS90s dip pH electrode assembly. High Speed Industrial Mixer. PS90s dip pH electrode assembly. High Speed Industrial Mixer. PS90s dip pH electrode assembly. High Speed Industrial Mixer. PS90s dip pH electrode assembly. AT-AM series proportional control dosing pump for pH correction. AC.LA.05A with low level cut-off for use with Caustic Soda. AC.LA.05A with low level cut-off for use with HCL. High Speed Industrial Mixer. PS90s dip pH electrode assembly. AT-AM series proportional control dosing pump for pH correction. AC.LA.05A with low level cut-off for use with Caustic Soda. AC.LA.05A with low level cut-off for use with HCL. High Speed Industrial Mixer. PS90s dip pH electrode assembly. AT-AM series proportional control dosing pump for pH correction. AT-AM series proportional control dosing pump for pH correction. AC.LA.05A with low level cut-off for use with Caustic Soda. AC.LA.05A with low level cut-off for use with HCL. High Speed Industrial Mixer. AT-AM series proportional control dosing pump for pH correction. AT-AM series proportional control dosing pump for pH correction. AC.LA.05A with low level cut-off for use with Caustic Soda. AC.LA.05A with low level cut-off for use with HCL. High Speed Industrial Mixer. AT-AM series proportional control dosing pump for pH correction. AT-AM series proportional control dosing pump for pH correction. AC.LA.05A with low level cut-off for use with Caustic Soda. AC.LA.05A with low level cut-off for use with HCL. High Speed Industrial Mixer. PS90s dip pH electrode assembly. AT-AM series proportional control dosing pump for pH correction. AT-AM series proportional control dosing pump for pH correction. AC.LA.05A with low level cut-off for use with Caustic Soda. AC.LA.05A with low level cut-off for use with HCL. High Speed Industrial Mixer. PS90s dip pH electrode assembly. AT-AM series proportional control dosing pump for pH correction. AC.LA.05A with low level cut-off for use with HCL. AC.LA.05A with low level cut-off for use with Caustic Soda. High Speed Industrial Mixer. PS90s dip pH electrode assembly. AT-AM series proportional control dosing pump for pH correction. High Speed Industrial Mixer. PS90s dip pH electrode assembly. High Speed Industrial Mixer. PS90s dip pH electrode assembly. High Speed Industrial Mixer. PS90s dip pH electrode assembly. High Speed Industrial Mixer. PS90s dip pH electrode assembly. High Speed Industrial Mixer. PS90s dip pH electrode assembly. With colour touchscreen for logging all process variables. P7687 pH controller with P&ID control. P7687 pH controller with P&ID control. High Speed Industrial Mixer. PS90s dip pH electrode assembly. Duty air operated double diaphragm pumps. Assist air operated double diaphragm pumps. Control Panel. With colour touchscreen for logging all process variables. P7687 pH controller with P&ID control. P7687 pH controller with P&ID control. PS90s dip pH electrode assembly. Duty air operated double diaphragm pumps. Assist air operated double diaphragm pumps. Control Panel. With colour touchscreen for logging all process variables. P7687 pH controller with P&ID control. P7687 pH controller with P&ID control. PS90s dip pH electrode assembly. Duty air operated double diaphragm pumps. Assist air operated double diaphragm pumps. Control Panel. With colour touchscreen for logging all process variables. P7687 pH controller with P&ID control. P7687 pH controller with P&ID control. PS90s dip pH electrode assembly. Duty air operated double diaphragm pumps. Assist air operated double diaphragm pumps. Control Panel. With colour touchscreen for logging all process variables. P7687 pH controller with P&ID control. P7687 pH controller with P&ID control. PS90s dip pH electrode assembly. Duty air operated double diaphragm pump. Assist air operated double diaphragm pumps. Control Panel. With colour touchscreen for logging all process variables. P7687 pH controller with P&ID control. P7687 pH controller with P&ID control. PS90s dip pH electrode assembly. Duty air operated double diaphragm pumps. Assist air operated double diaphragm pumps. Control Panel. P7687 pH controller with P&ID control. P7687 pH controller with P&ID control. With colour touchscreen for logging all process variables. PS90s dip pH electrode assembly. Duty air operated double diaphragm pumps. Assist air operated double diaphragm pumps. Control Panel. P7687 pH controller with P&ID control. P7687 pH controller with P&ID control. With colour touchscreen for logging all process variables. High Speed Industrial Mixer. PS90s dip pH electrode assembly. Duty air operated double diaphragm pumps. Control Panel. P7687 pH controller with P&ID control. P7687 pH controller with P&ID control. With colour touchscreen for logging all process variables. High Speed Industrial Mixer. PS90s dip pH electrode assembly. Duty air operated double diaphragm pumps. High Speed Industrial Mixer. PS90s dip pH electrode assembly. High Speed Industrial Mixer. PS90s dip pH electrode assembly. High Speed Industrial Mixer. PS90s dip pH electrode assembly. High Speed Industrial Mixer. PS90s dip pH electrode assembly. High Speed Industrial Mixer. PS90s dip pH electrode assembly. High Speed Industrial Mixer. PS90s dip pH electrode assembly. High Speed Industrial Mixer. PS90s dip pH electrode assembly. AT-AM series proportional control dosing pump for pH correction. AC.LA.05A with low level cut-off. High Speed Industrial Mixer. PS90s dip pH electrode assembly. AT-AM series proportional control dosing pump for pH correction. AC.LA.05A with low level cut-off. High Speed Industrial Mixer. PS90s dip pH electrode assembly. AT-AM series proportional control dosing pump for pH correction. AT-AM series proportional control dosing pump for pH correction. AC.LA.05A with low level cut-off. High Speed Industrial Mixer. AT-AM series proportional control dosing pump for pH correction. AT-AM series proportional control dosing pump for pH correction. AC.LA.05A with low level cut-off. High Speed Industrial Mixer. AT-AM series proportional control dosing pump for pH correction. AT-AM series proportional control dosing pump for pH correction. AC.LA.05A with low level cut-off. High Speed Industrial Mixer. PS90s dip pH electrode assembly. AT-AM series proportional control dosing pump for pH correction. AT-AM series proportional control dosing pump for pH correction. AC.LA.05A with low level cut-off. High Speed Industrial Mixer. PS90s dip pH electrode assembly. AT-AM series proportional control dosing pump for pH correction. AC.LA.05A with low level cut-off. High Speed Industrial Mixer. PS90s dip pH electrode assembly. AT-AM series proportional control dosing pump for pH correction. High Speed Industrial Mixer. PS90s dip pH electrode assembly. High Speed Industrial Mixer. PS90s dip pH electrode assembly. High Speed Industrial Mixer. PS90s dip pH electrode assembly. High Speed Industrial Mixer. PS90s dip pH electrode assembly. High Speed Industrial Mixer. PS90s dip pH electrode assembly. With colour touchscreen for logging all process variables. P7687 pH controller with P&ID control. P7687 pH controller with P&ID control. High Speed Industrial Mixer. PS90s dip pH electrode assembly. Duty air operated double diaphragm pumps. Assist air operated double diaphragm pumps. Control Panel. With colour touchscreen for logging all process variables. P7687 pH controller with P&ID control. P7687 pH controller with P&ID control. PS90s dip pH electrode assembly. Duty air operated double diaphragm pumps. Assist air operated double diaphragm pumps. Control Panel. With colour touchscreen for logging all process variables. P7687 pH controller with P&ID control. P7687 pH controller with P&ID control. PS90s dip pH electrode assembly. Duty air operated double diaphragm pumps. Assist air operated double diaphragm pumps. Control Panel. With colour touchscreen for logging all process variables. P7687 pH controller with P&ID control. P7687 pH controller with P&ID control. PS90s dip pH electrode assembly. Duty air operated double diaphragm pumps. Assist air operated double diaphragm pumps. Control Panel. The system has been designed to neutralise the pH of our customers effluent making it compliant with the local legislation and adhering to their consent to discharge agreement. With the waste water from each of the customers industrial processes, including waste water from the rinses, the regeneration of the de-ionised water beds and the pre-treatment baths - all being collected into an underground sump. Complete with a full suite of technical drawings to make mechanical integration as simple as possible. Ready, wired and tested to ensure that the onsite electrical engineers can quickly and easily bring the system into operation. A commissioning visit from our service engineers to ensure that the pH neutralisation system is calibrated and working in the manner specified by the customer. The waste-water to be pH corrected is transferred to the correction tank using air operated double diaphragm pumps. Using a series of level controllers and sump mounted low level float switches the control panel calls for the solenoid valves. These in turn control the incoming air flow to the pneumatically operated double diaphragm pumps which transfer the waste-water to the mixing tank. The pH electrode mounted inside the mixing tank works with the pH controller to call for either the acid dosing pump or alkaline dosing pump to neutralise the pH in the waste-water. The addition of the top mounted high mixer improves the efficiency of the chemical reagent reducing the required contact time for neutralisation. By carefully calculating the contact time required at the extremes of the incoming pH scale the volume was calculated to ensure that the pH neutralisation system can return the neutralised effluent to drain through a cascading sump arrangement. Our customer's core preference was for a complete solution to their pH neutralisation which could easily be positioned into place and simply integrated into their existing processes, including drawing the waste water up into a treatment tank from a sump. We provided our customer with a single fabricated solution which could be lifted using the skids of a fork lift truck for easy transportation to site, and so that it could be simply manoeuvred to the desired site location. The fabricated solution was destined to be located outside. To protect the instruments from the environment all the fabricated enclosures containing the control panel, instruments, air operated double diaphragm pumps and the chemical dosing pumps were provided with transparent covers to protect them from the elements. All the wired connections and external electrical items such as the top mounted alarm beacon and all electrical glands have been supplied to IP65 specification, which ensures that they are suitable to be located outside. The pH correction tank was fabricated in chemically resistant polypropylene and also mounted onto our skid mounting area - allowing the whole unit to be lifted from a fork lift as well easily manoeuvred for final positioning. Access to the tank is via a half removable lid complete with a mixer bridge to support the high speed mixer. The enclosure containing the control panel was fabricated as a separate chamber isolating it from the lower enclosure, which contains the duty & assist air operated double diaphragm transfer pumps. The chemical containers were located in another enclosure located at the opposite end of the skid mounted unit. This skid mounted enclosure includes 2 separate bunded areas - each designed to contain a 25 litre chemical container with a capacity of ~35 litres - to contain the contents of each of the chemical containers in the event of a spill or leak. The hoses connecting the air operated transfer pumps and the chemical dosing pumps have been supplied as double confined dosing tube to ensure containment in the event of the tubing becoming compromised. When the waste water has been pH corrected, the customer requested that this is discharged into a cascading sump arrangement via an outlet on the tank. The customer specified that the outlet was via a 3" flanged connection and the location of this agreed during the design phase of the project. To ensure compatibility with the customer's process, the system was also supplied with the counter to the flange for simple on-site installation. From a practical perspective, in the future, the pH neutralisation system might need to be relocated, cleaned or inspected. For this reason, we included a foot mounted drain valve allowing the customer to empty the tank when required. The control panel is mounted into the front enclosure, behind a removable transparent covering. This pH neutralisation system uses a number of inputs to fully automate the treatment of pH correction of the waste water with very little human involvement required. The waste water is transferred to the treatment tanks using the air operated double diaphragm pumps. As the volume of waste water generated can vary depending on the processes occurring in the customer's factory, two air operated double diaphragm pumps have been fitted; one acting as a duty transfer pump and the second acting as an assist. The duty and assist pumps mean that during normal operation, the duty pump has the flow rate to transfer enough volume of waste water to the treatment tank to ensure it can be corrected. As the processes used by our customer vary, the amount of waste-water generated can also vary. To cope with increased volumes, a second air operated double diaphragm pump has been fitted as an assist. This potentially doubles the amount of waste water that can be transferred to the treatment tank, preventing the sump from flooding in times of increased production. The duty transfer pump and assist transfer pump are controlled based on the level in the sump. By using low level float switches located in the sump, at a high level, the duty pump is called to transfer the waste water. If the level continues to rise to the second high level (high-high-level), then the assist pump is engaged to reduce the volume of waste water in the sump and transfer it for treatment. Each air operated double diaphragm pump uses an air feed line which passes through a solenoid valve. The solenoid valve is controlled from a level controller within the control panel which in turn takes it's signal from the level electrodes. In a pH neutralisation system, having an accurate pH controller designed for industrial usage is crucial. The P7687 combines accurate pH measurement with precision control functionality. The P7687 is part of our new generation of process control instruments with this specific model featuring PID control of pH. As the P7687 is a PID (Proportional, Integral and Derivative) pH controller it provides a signal to the dosing pumps enabling them to automatically adjust the speed or frequency that the dosing pumps operate at, meaning that the pH can be very precisely controlled to the desired set-points. The PID control allows our customer to accommodate wide fluctuations in the measured pH value, as well as ensuring that only as much chemical as is required to neutralise the pH between the set-points is dosed into the wastewater treatment tank. The discharge pH controller is another P7687 pH controller taking a signal from a PS90s located in the waste-water or effluent outfall sump. The discharge pH controller constantly monitors the treated wastewater to ensure that it is compliant with the customers consent to discharge agreement. In this particular installation, it's imperative that the final pH level is logged so the P7687 is continually providing the discharged pH value to the data logger. The control panel also includes a digital data logger in the form of our new AWE-99 colour touchscreen data logger. The AWE-99 along with the larger AWE-141 digital data loggers are capable of data logging inputs from 4-20mA signal, High Speed Counter or a Modbus value amongst many, many, other input signals. In this instance the value from the discharge pH controller is being logged to create a trend graph showing the change in pH over time. All this data is being logged directly to the onboard memory of the AWE-99, the customer also has the option of backing this log up to an external USB drive which can be connected to the front of the AWE-99. In addition - with a built in web-server the AWE-99 can be connected to the customers local intranet, allowing them to view the discharge pH from any device connected to the local network. The AWE-99 digital data-logger allows the customer to log the pH of their final effluent discharge which can then be examined by an external regulatory body so that they remain compliant with their consent to discharge agreement. The AWE-99 data logger fitted to the customer's pH neutralisation system was supplied complete with 2 additional inputs, meaning that the customer can also log the final effluent discharge flow from a V-Notch tank and the final temperature if required. As a fully expandable instrument, the AWE-99 can be fitted with many further inputs even if the data-logger is already installed and in-situ. The tank mounted pH electrode assembly is our PS90s dip mounting pH electrode assembly. Designed to provide continual measurement of the pH in unpressurised vessels, sumps or pits - the PS90s is ideal for this purpose. Utilising a rigid mounting tube with an adjustable mounting flange the PS90s provides precision pH measurements from the PS183-20B pH electrode located at the tip of the PS90s. Given that the customer is using a powerful and accurate pH controller in the P7687 it's important to pair the pH controller with a precision pH probe designed specifically for industrial usage. This is where the PS183-20B pH electrode comes in, offering accurate pH measurements in process environments. In addition using the BSP threaded connections the PS183-20B can be easily removed making calibration of the pH electrode simple and straight forward. As with all sealed pH electrodes containing a liquid or gel reference junction, they eventually need replacing as the reference material is consumed. With the PS90s only the pH electrode insert, model number PS183-20B, is replaced, providing our customer with a low cost of ownership as only the pH sensor is replaced, the riser tube and precision electronics can be used over and over again. The rigid mounting tube of the PS90s ensures that the pH electrode can continually provide accurate pH measurements to the pH controller, even when the tank mounted high speed mixer is operational. By incorporating a high speed industrial mixer into the wastewater treatment tank, we can improve both the chemical efficiency and reduce the contact time that the chemical reagents require during pH neutralisation. As the treatment tank and the high speed industrial mixer have been designed and assembled here at our Stafford factory we can ensure that all the constituent parts are working together as efficiently as possible. The high speed mixer is supported by the fabricated mixer bridge and the shaft and propellor have been designed to ensure that they accommodate the volume of liquid in the tank and the dimensions of the whole fabrication. To help matters further, the location of the mixer bridge ensures that when not operational, the half access lid can easily be opened for maintenance, cleaning and inspection. The TM2 high speed industrial mixer is ideal for applications such as the pH neutralisation of wastewater. By creating a vortex within the tank the chemical reagents dosed from the dosing pumps are forced through the waste water to give good distribution. Combining good and even mixing along with a pH controller offering PID control as well as proportional control dosing pumps - the customer can be confident in both the waste-water treatment process and that chemical reagents aren't being needlessly dosed into the system. One key component of the waster water treatment is for pH neutralisation to occur. The customer's processes generate effluent on either the acidic or alkaline side of the pH scale, depending upon which combination of processes are operating during their production process. The waste-water treatment system is able to neutralise the pH of the incoming effluent if it's on the acid end of the pH scale or the alkaline end, thanks to the system being able to dose from one of the two chemical dosing pumps. Working with an incoming signal from the tank mounted PS90s pH electrode assembly and the P7687 PID pH controller - the pH controller sends a signal to either the acid dosing pump or the caustic dosing pump. Each of the pumps are our AT4-AM proportional dosing pump series with wetted parts suitable for each chemical reagent. With a maximum output of 60 Litres / Hour each, the AT4-AM dosing pumps can be automatically speeded up or slowed down by the pH controller to ensure that just the right amount of chemical reagent is dosed into the process to neutralise the pH. The suction lance assembly fitted to each of the chemical dosing pumps allows for easy manual handling of the chemical containers, and when operational, maintains the prime of the dosing pumps. 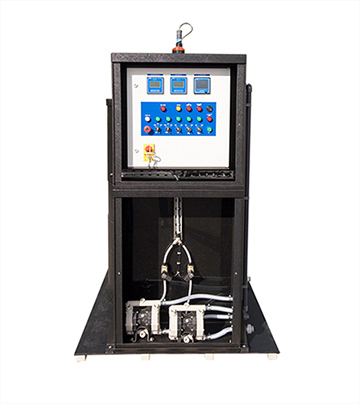 The integrated low level float switch also provides a signal to the control panel which can prevent the unit from operating when the chemical reagent has been used. To ensure that operator is aware that an alarm condition has been entered, an audible alarm sounds; the alarm beacon is illuminated and the corresponding low chemical level indicator is illuminated on the front of the panel. A remote alarm connection is also included for the customer for integration into their internal process system so that they are aware that the chemical needs to be replenished to ensure the pH neutralisation system can resume correct operation. The pH neutralisation system uses model AC.LA.25A suction lances specifically designed for use with 25 litre chemical containers. The suction lance is placed into the container aperture with the lid removed. The suction lances can be located within the chemical container by using the adjustable mounting flange, which also creates a seal over the opening. Using suction lance assemblies combined with the chemical containers being placed in the bunded area of the enclosure, which in turn is located behind a transparent cover plate - ensures that chemical handling risks are minimised where possible. Changing the chemical container once the chemical has been used is simple, as the suction lance assembly can easily be lifted out from the empty vessel, and placed into the new vessel once it's securely positioned into the bund. As well as assisting in the handling of the chemical reagents, each suction lance assembly includes an integral non-return valve to help ensure that the pump remains primed. As the customers' effluent is collected in a sump arrangement located underneath the water treatment system, it has to be transferred to the dosing tank for pH correction. Contained within an enclosure, complete with a front mounted transparent cover are two double diaphragm pneumatic pumps which are ideal for the job. With wetted parts in polypropylene and PTFE the double diaphragm pneumatic pumps are resistant to the chemistry used in the customer's processes. 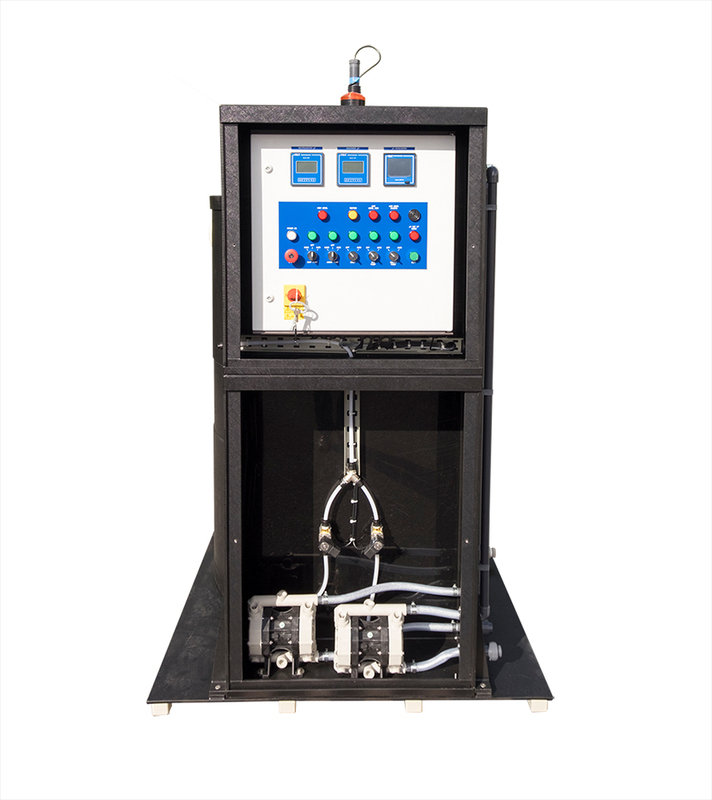 The control panel controls two solenoid valves which in turn control the air flow to the pumps, allowing them to be automatically turned on, based on the incoming signal from sump mounted float switches. The double diaphragm pneumatic pumps are arranged in a duty and assist formation, with the assist pump being switched on when the customer's processes generate enough waste water to require the addition of the second transfer pump. The air operated double diaphragm pumps used were the AWE models PP50's with 1/4" outlets and maximum flow rates of 50 Litres / Minute. There are many advantages that are available when using an air operated double diaphragm pump to transfer waste water, effluent or even chemical reagents. They offer exceptional flow rates which can be easily adjusted by using an air regulating valve. In addition - with relatively simple construction, the diaphragm can be easily removed and cleaned for periodic maintenance, and they are of simple design and proven construction meaning that there really is very little to go wrong with them. Following the customer briefing and the approval of the designs, the process of completing the fabrications, assembly and control panel build were completed within 6 weeks. As the plant was designed to be skid mounted, loading on to a flat bed truck for same day delivery, and then positioning the pH neutralisation system to it's site location was a relatively simple procedure. From the customers perspective, once the inlet and discharge pipework were connected, power brought onto the system - the pH neutralisation was ready for commissioning. The commissioning of the pH neutralisation system was completed by two of our Service Engineers within 7 weeks of us receiving the order from our customer. If you would like more information on water treatment, or if you need a permanent or temporary waste water treatment solution, then please don't hesitate to get in touch with us, either by calling, emailing or using the button below.